“He worked as hard as a farmer, planting the words ‘Yes, we can!’ like seeds in spring. This is beyond sick. Instead of teaching youngsters to be critical thinkers and question those that hold the reigns of power, it teaches them to revere Obama like some sort of messiah. On the heels of a controversial children’s book about Barack Obama – which stated “white voters would never vote for a black president” and that “Barack’s former pastor” said “God would damn the United States for mistreating its black citizens” – comes a new lesson that casts America’s 44th president in a messianic light. Literally. And – surprise – it’s Common Core-aligned. The lesson plan and accompanying visual presentation were authored by Sherece Bennett, and is for sale on TeachersPayTeachers.com. 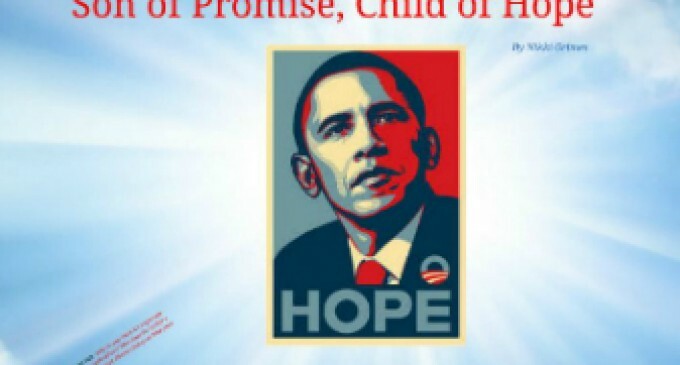 It’s all based on a book titled, “Barack Obama: Son of Promise, Child of Hope,” by Nikki Grimes. “Hope hung deep inside of him,” the book adds. Uh oh – another Obama-inspired Biblical reference in a government school! But there’s no controversy here. Leftists will use God and the Bible, in instances such as these, when it appropriately fits their propaganda purposes. “The work was grueling, with stretches of failure, and puny patches of success. Door-to-door Barack went, early mornings, late nights, pleading and preaching, coaxing strangers to march together, to make life better for everyone. This mythical interpretation of Obama was the #1 New York Times bestselling picture-book biography of Obama, according to Amazon.com. Still, given the large number of activist teachers in the U.S., there’s a very real possibility this is the version of Barack Obama’s history many of our young students are learning in a school near you.